CITRUS HEIGHTS, CA (MPG) - Construction has begun on a new commercial kitchen that will become a part of a training academy located on Mariposa Avenue near Antelope. The facility is operated by The Glass Slipper, a non-profit organization based in Citrus Heights. The new kitchen will be used to train participants in culinary, hospitality and nutritional skills. The Glass Slipper is an all-volunteer organization that helps girls and young ladies in the foster-care system make a successful transition to adulthood through its Ready by 21 Academy. With many years of experience in the foster care system, Jackie Guzman saw that girls raised in this environment often lacked life skills training and emotional support. These girls entered the foster-care system through no fault of their own. Sadly, despite the efforts of social services, it’s easy for them to fall through the cracks. When compared to other youth in America, foster youth have the highest rates of school drop-out, unemployment, exploitation and teen pregnancy, and are highest risk of homelessness upon emancipation from the system. Jackie and a small group of volunteers started The Glass Slipper in 1997 to help these “at risk” girls. The training, mentoring and emotional support that they provide helps the girls to improve their life skills and self-esteem while receiving guidance in positive directions. The commercial-grade kitchen under construction will add new life skills training to the existing Ready by 21 Academy. Construction of the commercial kitchen is also a volunteer project. 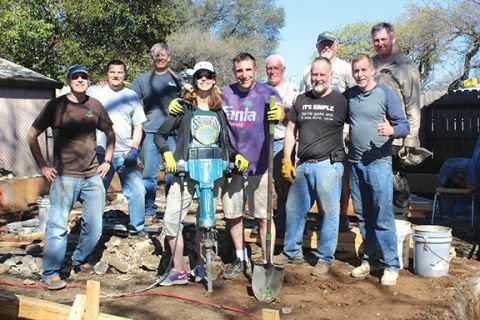 A non-denominational men’s Bible study called, “The Band of Brothers,” as well as other volunteers and trades-people will provide most of the labor to build the kitchen from the ground up. Money for materials is dependent upon private donors, community and local churches. Construction is currently under way on the 810 square foot kitchen addition and is expected to be substantially completed this year. The Glass Slipper always welcomes volunteer support and monetary donations. The Glass Slipper Organization, Inc. is a 501(c) (3) non-profit. Donations and gifts are tax-deductible, as allowed by law. The Glass Slipper’s Federal Tax Payer I.D. Number is 20-8599121.